I used the siphon method and got antifreeze through the shower, sink, and outdoor shower. Do I leave the plug to the drained water heater on or off? I’m worried I only have one petcock underneath the camper and it’s the freshwater drain. Im assuming it’s OK if that’s the case but manual said there may be another one? Manual instructions were super easy to cycle the antifreeze. Also, do I close the outdoor shower dial handles or leave them in the open position? Did you open the low point drains? Look under the trailer and you should see a red and a blue plastic (PEX) pipe sticking down. These are the low point drains and the valves for these are directly above the pipes, probably under a cover that you will have to remove. They look like this on our 2250DS. In my 27Q there is a regular "mess" of plumbing and wiring immediately behind the panel for accessing the waterheater bypass valves. The low point drain valves are in there too and one of them is buried under the tubing and wires. 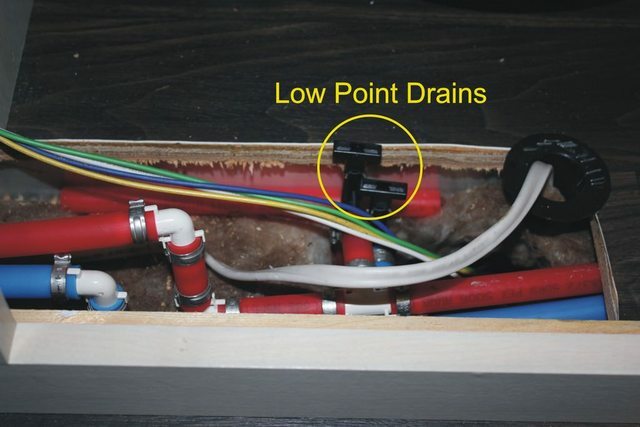 On mine, the low point drains are seperate and neatly mounted under the kitchen sink. Easiest way to find them is to look under the camper and find the red/blue tubes sticking out. Note that they are not as low as the fresh water drain. Mine are tucked up under the skirt. Our 2106FBS low point valves are located in the bottom cabinet of the wardrobe in the bathroom with outlets stopping about a half inch below the coroplast. On the outdoor shower you should have pumped antifreeze through it as well. With antifreeze you would need to keep any low level valves closed to prevent it from draining out so you would leave the outdoor shower closed. I only blow my plumbing out with air. Due to this I will leave all valves open to prevent pressure build up. After draining the water heater and bypassing it I just put the plug back in and hand tighten. This keeps any creepy crawlies from getting in and makes it easier to give it a quick flush before I put it back into service. Interesting i can’t find a low point hot water drain anywhere. The only one I can find is the white fresh water petcock. The i looked under the sink and poked my head from the water pump to where the lines go up the shower. There is a check valve on the city water connection itself to stop water from back flowing out of it. If you remove the screen washer you will see a white button. This is the valve. If you push it to hold it open it until antifreeze comes out you will have section of the plumbing winterized. It is important to get antifreeze into this outlet as water does sit in it, so injecting antifreeze into it is wise. Note that this is your cold water and as there is a check valve the antifreeze will not go into your fresh/potable water tank and as you will have set the bypass for your hot water tank it will not be affected. That mat is called coroplast. There should be two PEX pipes coming through to drain the plumbing lines. Have you tried calling Winnebago to see where they are suppose to be? I wouldn't try to open them if you cannot find the outlets but would take it back to the dealer as a warranty issue.